Superb for baskets, weather proof and long lasting. One of the most popular summer fowering plants creating brilliant summer garden displays. This proven winner is bred to withstand the wettest summer and to produce the strongest blooms. In a wonderful mix of warm Apricot Shades flowering right up to the first frosts in Autumn. Easy to get great displays in hanging baskets, wall planters or pots on the patio. Supplied as 20 garden ready plants in a mix of warm Apricot Shades. Year after Year, Begonia Illumination Apricot Shades features in our Top 3 best-selling bedding and basket plants. Why? It's undoubtedly the combination of fantastic performance in baskets and tubs whatever the Summer weather, combined with the gorgeous blend of warm tones and shades that the mix produces. 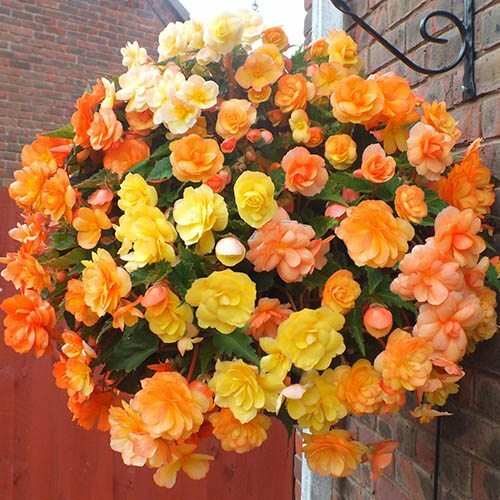 This beautiful variety has flowers in wonderfully warm shades of yellow, gold, apricot, orange and ochre that will fill your hanging baskets and patio containers with colour from May until October! The blooms are incredibly weather proof, long lasting and plentiful, held on strong healthy plants with a gently trailing growing habit. They look best simply on their own, as there is enough subtle colour variation not to look too overdone. One for the short-list for sure. Supplied as 20 Garden Ready Plants. Flowers from late May until first frosts in the autumn. Not frost hardy so keep protected until the last frost. Pot on for 2-4 weeks before planting. Begonia ‘Apricot Shades’ grows well in sun and shade, and its trailing habit makes it perfect for growing in pots and hanging baskets.